People are moving back downtown -- and they want grocery stores in their neighborhoods. Land prices: It is usually more expensive -- particularly in larger cities -- to buy land downtown than on the periphery of the city or in the suburbs. 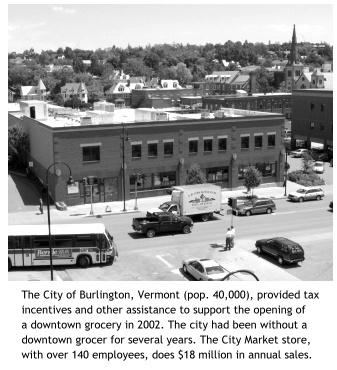 Land assembly: Given that today's average grocery store is more than 50,000 square feet in size, and that national supermarket chains have become comfortable with their business models, it is very difficult to find enough contiguous land available in a downtown area without either great expense or demolition of buildings (sometimes of historic significance), or both. Siting: The suburban retail development model -- store set back from the road, surrounded by a sea of parking -- is now commonplace for American supermarkets. Downtown development patterns -- zero-setback, parking in the rear or in a parking lot elsewhere in the district -- are unfamiliar, and therefore perceived as risky, to the national chains (and to lending institutions). They are also likely to believe that they will need the same number of parking spaces as for a comparably sized suburban store, not knowing how many district residents are likely to reach the store on foot, by bicycle, or using public transit, rather than by car. Market: Most supermarket chains need to be convinced that older downtowns and neighborhood commercial corridors have enough market demand to support a supermarket. Zoning: Zoning laws sometimes make it difficult to build or operate downtown grocery stores - particularly as part of a mixed-use project in which zoning officials fear that noise from a 24-hour or late-night grocery store or smells from its trash area might disturb residents. In spite of these obstacles, a growing number of communities are succeeding in attracting national grocers. 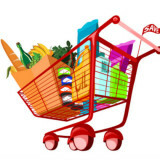 In 1998, for example, a group of citizens in Washington, DC's 14th and U Streets neighborhood went door-to-door asking neighborhood residents where they shop for groceries, how much they would spend in a neighborhood grocery store if one were available, what their level of commitment would be to supporting a neighborhood grocery, and their demographic characteristics. This information helped persuade Whole Foods Market to open a store in their neighborhood. If you're interested in bringing a national grocery store chain into your downtown, it pays to be well-prepared before making contact. The grocer will want to know as much as possible about: the demographic characteristics of the district; available space; zoning restrictions; and the size and location of potential competitors. Even if all your answers are exactly what the grocer wants to hear, it will probably still be skeptical of opening a downtown store. Your planning commission's positive attitude -- along with assurances of support from other city leaders -- will go far towards making the grocery company feel more comfortable. … article continues with suggestions on how to attract grocers to downtown locations.